Easter is here and while most parents were coloring eggs we are going to be making egg heads. I’m always looking for new fun things for the kids to do. This was a fun and easy craft project that involved all 5 of my kids. No age limit on this one folks. I even had our 4-H group do it for their recycling project. 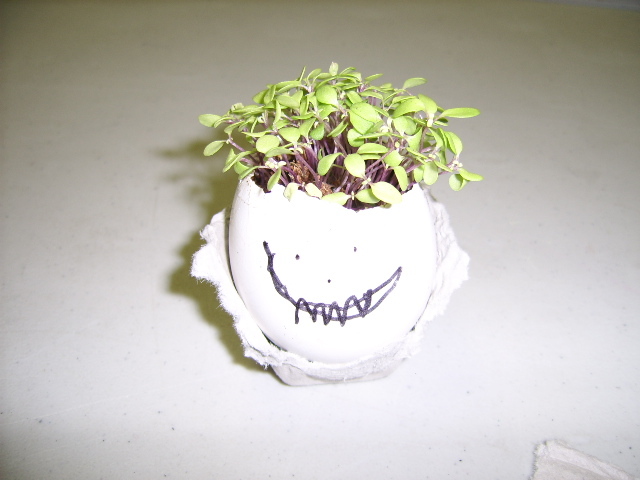 Things you’ll need: eggs, egg carton, dirt, seeds, and a permanent marker. Take a knife and tap the top of the egg open and pour out the egg yolk. Do this at breakfast so the egg can be eaten. Let the kids draw a face on the egg with the marker. Cut the egg carton up so that you have 12 little cup holders for your eggs. You can ether use a bag of dirt or you can buy dirt disks at your local Farm and Home, Lowe’s or Menard’s. The kids love to watch the dirt disks expand. They are made of recycled paper and compost so it fits in to the whole recycling theme. Put the egg in its holder, add dirt and water, and sprinkle a few seeds on top. In a few days your egg head will start to grow some hair. It’s basically a home made Chia Pet. 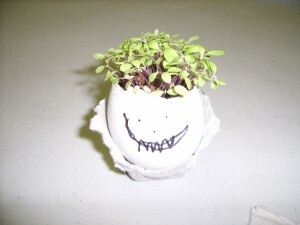 After about two weeks you’ll need to transplant your egg head into a pot or a garden. Simply tap and crack the bottom of your egg. Make a hole big enough for the whole egg to fit in. 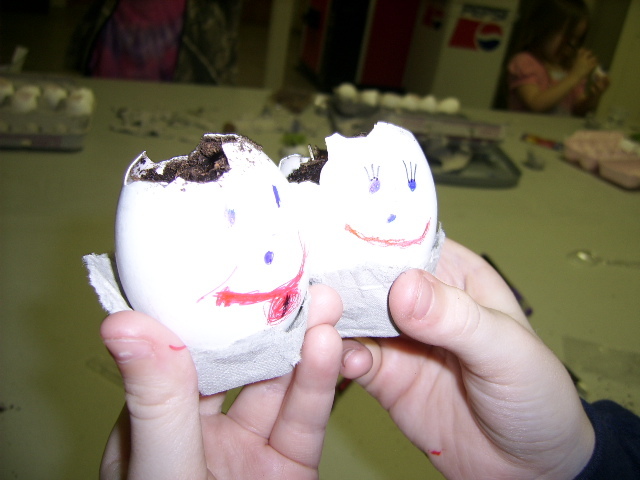 Egg shells are great for your garden. They not only provide nutrients for the plants but also aerate the dirt. Don’t stop there – egg cartons make great trays for starter plants for your garden. If you use the cardboard/paper cartons you can plant the whole cup into your garden.